With the May 15th due date for calendar year not-for-profits just around the corner and provisions in the Tax Cuts and Jobs Act increasing scrutiny on not-for-profits’ executive compensation, employee benefits, and unrelated business income, it’s a good time to take a look at the message your organization’s tax return is sending. In years past, the IRS Form 990 was no more than a compliance task; an annual filing requirement to keep the IRS at bay. After all, there is no tax due, so what’s the big deal? The big deal is, people are watching. For as long as most can remember, there have been public disclosure requirements for Form 990. Internal Revenue Code Section 6104 requires exempt organizations to make the prior three years of tax returns, Form 1023, and IRS Determination Letter available to the public. It used to be that the public had to request Form 990s by mail or in person, and the not-for-profit organization could charge for each page supplied. Now, the Form 990 is instantly available with the click of a mouse. IRS Info Release 2016-87 guaranteed that 100 percent of filed Form 990s would be downloadable and searchable by the public through Amazon Web Services. In addition to Amazon Web Services, interested parties have other ways of examining your Form 990 data. Watchdog sites like GuideStar, Charity Navigator, BBB Wise Giving Alliance, and Charity Watch analyze thousands of Form 990s with the goal of helping donors make informed giving decisions. These organizations post return copies, ratings, rankings, evaluations, financial metrics, and comparative analytics through their respective websites. Between these watchdog groups and Amazon Web Services, people have a treasure trove of Form 990 information at their fingers tips. So if people are watching, what are they looking for? While financial statements focus on the numbers, Form 990 digs much deeper. The tax return uncovers details on your mission, program service accomplishments, governance, management practices, compensation, political activities, related organizations, transactions with insiders, percentage of general and administrative (G&A) costs, fundraising dollars spent, unrelated business income (UBI) amounts, and much more. With so much information being communicated, your not-for-profit should look carefully at what it’s presenting to ensure you are optimizing the message you want to send to your readers. The following provides a closer look at some key Form 990 areas and some compliance tips that may help with your reporting. Develop an attention grabbing, heartstring tugging, succinct description of your mission that shouts your purpose to the world (and fits on line 1). Make sure to accurately reflect the independence of your board members. If they are not independent, your return should contain additional disclosures such as Schedule L and/or R.
Make sure it’s signed and dated by an officer of your organization and your Form 990 Tax Preparer. This page should be one of your primary marketing tools. Go into great detail on your vision, mission, programs and accomplishments. Make the reader want to join your cause and donate. Answer yes to questions 2 and/or 3 if you had new or changed program service accomplishments. Use Schedule O, Supplemental Information, to describe them and why the revenue generated is not unrelated business income (UBI). This is a way to inform the IRS of smaller shifts in purpose without requesting a new determination letter. Although tempting, don’t simply answer all the questions the same as last year. Read through them carefully. Pay special attention to questions concerning related/controlled entities, excess benefit transactions, political activities, special events, and professional fundraising. For any yes responses, make sure to complete the associated schedule for additional disclosures. The number of employees should include those paid by the organization as well as payroll agents and common paymasters. If Line 3a is checked yes, file Form 990-T, Exempt Organization Business Income Tax Return, even if the activities do not result in taxable income. The public and watchdog groups will look here to make sure you have good policies, procedures and controls in place. Know the rules for whether or not a board member is independent. Additional disclosures will likely be required for any that are not. Take advantage of Schedule O to highlight the details of your policies and how they are enforced and describe how your top management’s salaries are determined. Be aware of the rules and salary thresholds around who is and who is not required to be listed here. Report numbers consistently with related organizations and on Schedule J, Compensation Information. Note that reporting in Part VII is based on the calendar year end that falls within your tax year, so there can be discrepancies between wage amounts here and on Part IX. Categorize your contributions correctly among lines 1a-1f, then note any non-cash amount included on any of those line items on line 1g. Schedule G will be required if this number is >$25,000. Verify all UBI assumptions annually and make sure Column (C) matches your Form 990-T. Capture the contribution portion of revenue from fundraising events on line 1c instead of including on line 8a. Do not blindly follow the financial statements, but be able to reconcile between the two (Schedule D, Supplemental Financial Statements). Correctly capture officer, director, trustee and key employee compensation on line 5. This should be based on the organization’s tax year and include amounts received for pension plans, 401(k) match, and other benefits received. If you have loans to/from officers, directors, key employees, highly compensated employees, or disqualified persons, list them on lines 6 or 22 of the balance sheet and also complete Schedule L.
Amounts over certain thresholds in other assets or liabilities must be detailed on Schedule D.
Make sure your net assets are properly classified as unrestricted, temporarily restricted or permanently restricted. This is where you show the value of donated services and use of facilities that are not included on the Form 990. Unrealized gain/loss on investments is reflected here, but not included in net income for tax purposes. 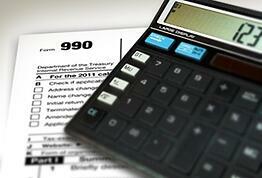 The above covers the core Form 990. In future publications, we’ll highlight important planning tips for supplemental schedules and discuss what the IRS is looking for on Schedule A, Schedule R, and everything in between. A tax advisor experienced with not-for-profit organizations and the Form 990 may be able to assist you in creating the roadmap you’d like to see for your organization. For more information, please contact us. Lisa Burke is a Senior Manager in the Not-For-Profit & Education Tax Practice. She can be reached at 816.945.5500 or lburke@cbiz.com.